The vibrantly purple Amethyst, a variety of quartz, has long been worn by royalty and was a favourite of both St. Valentine and Leonardo da Vinci. Saint Valentine was thought to wear a ring set with an antique Amethyst carved with an image of Cupid. It is said to be a stone of pure, true, emotional love. Often exchanged between two lovers to strengthen their commitment. Amethyst has been a prized gem for centuries. It is the birthstone for the starsign Pisces and the month of February and is included in royal collections all over the world, from ancient Egypt to the British crown jewels. The name Amethyst derives from the ancient Greek word amethustos, meaning sober. It was said that an Amethyst could prevent the bearer from becoming excessively drunk, and that its bright colour came from the god of wine, Dionysus, pouring out his wine over a clear crystal whilst in mourning. It is one of the stones that was most highly prized in the ancient world, and continues to be prized by many people today. Amethyst has been thought to have many attributes throughout history, and all of them are good. The stone was thought to control evil thoughts, quicken intelligence and that it would bring forth the highest, purest aspirations of human kind. Chastity, sobriety, and control over one’s thoughts were all attributes heightened by wearing the stone. Amethyst was also said to encourage calmness, bravery, and contemplation. Historically, the stone was believed to assist prophecy and visions and to bring riches and powers to its owners. Sincerity and peace of mind. For centuries, Amethysts have been thought by many people to be an excellent remedy for many ailments such as stress, insomnia and headaches. It is also reported to help sharpen the conscious mind and enhance mental powers. Found in as many places as Brazil, Bolivia, Mexico, Africa, Canada, Russia, USA and Europe this beautiful gemstone with a vibrant colour is steeped in ancient magic and it is as popular today as it was two thousand years ago. Amethyst is a complete joy to wear. However, sunlight and exposure to heat can cause the colour of amethysts to deteriorate. Avoid any contact with chemicals such as household cleaners or hairspray. To clean, use a soft toothbrush or cloth and a solution of mild dish soap and warm water to gently scrub and clean the stone. 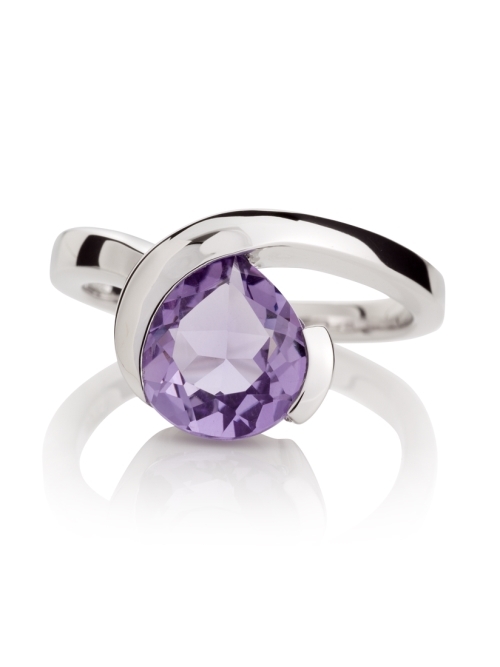 We stock a wide range of Amethyst jewellery in store and on our website. Or why not book a private consultation to discuss having a bespoke ring, earrings, pendant or bracelet made. Contact us to arrange your free consultation today. Older PostThe Joy of Palladium Wedding Rings!